You have worked hard to build a highly productive and diverse team that fosters an environment of creativity and innovation. But diversity can also create conflict when individuals bring different personalities and work styles together. Effective managers understand that reducing the impact of workplace conflicts is the key efficient business operations. By keeping your team members focused on performance and minimizing the impact of potential conflicts, you can greatly improve your team’s output. Managing conflicts quickly and effectively can prevent disruptions and loss of productivity. 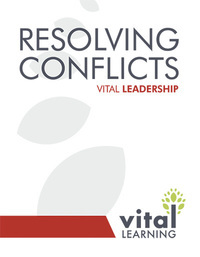 The Vital Learning Resolving Conflicts™ course equips supervisors, managers, and team leaders with the tools to recognize conflict and handle it quickly and effectively. When managers and team leaders understand the signs of conflict and find the root cause, they can quickly eliminate the issues and minimize the negative effects. Facing conflicts directly allows team leaders to preserve the integrity of their teams and demonstrate a commitment to individual performance and growth. 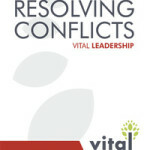 Click the “e” to immediately enroll and begin the Resolving Conflict online course.